D.F.C. 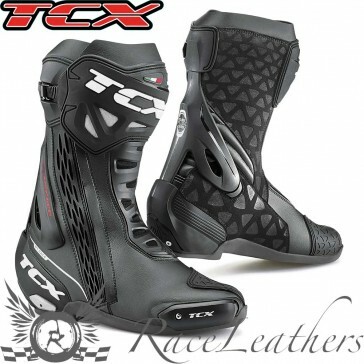 System is the ultimate innovation developed in the TCX Research and Development Dept. to offer an excellent balance between flexibility and protection. The structure, made of a special polyurethane compound, offers the foot and leg to naturally flex forwards and backwards, which preventing from ankle joint twisting. injury. The PU frame of the system is thin and shaped around the boot to offer a flat internal surface, which allows a good grip on the bike, and prevent from becoming caught on the bike while riding. D.F.C. System is engineered to also offer a superior level of protection in case of impact; the heel counter is designed to absorb impact energy and compression and it is equipped with rear and lateral slider to facilitate the natural sliding in case of a fall. Newly designed over-injected elastic front area studied to grant a precise fit in the instep zone. Over-injected elastic side panel combined with a zip is positioned on the external boot side to allow an easy step in and a superior fit around the foot/leg area. Quick release, micro-adjustable aluminum buckle joined to the shin plate and designed to perfectly fit different calf anatomies. Lightweight mono compound rubber sole perfectly integrated in the boot shape to offer improved feeling. The new tread features differentiated areas studied to grant a superior level of grip on the foot-peg and freedom of movement while riding.